VS. MODE! 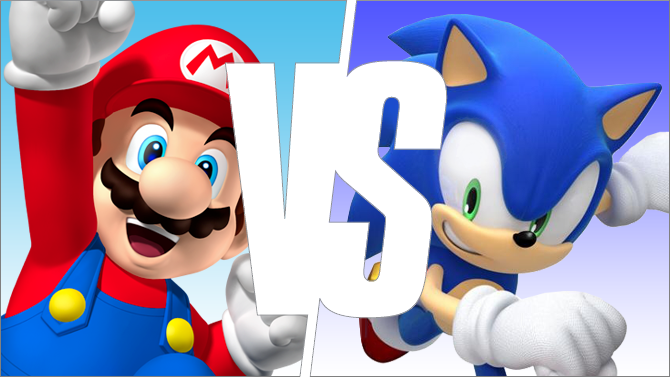 Super Mario 3D Land Vs. Sonic Generations – A Critical Hit! One game is the nostalgia-filled Nintendo 3DS outing of an iconic character with a long-running series, that incorporates elements from various installments in the character’s history, and was released in November 2011. The other is– oh, wait. Mario and Sonic have had a long-standing rivalry ever since the blue hedgehog first appeared back in 1991. While the rivalry has cooled off slightly since Sega stopped making consoles, when both characters came out with their own glasses-free 3D nod to the past just a week apart, it became almost irresistible not to stand the two games up side-by-side. How do they compare? Is one clearly the better handheld trip down memory lane? This is VS. MODE! Super Mario 3D Land: Developed by Nintendo EAD Tokyo—the same people who did the Super Mario Galaxy games—Super Mario 3D Land could be viewed as a sequel (of sorts) to several Mario games simultaneously. Being a handheld game with “3D Land” in the title, you could consider it a proper follow-up to Super Mario Land 2: 6 Golden Coins (previously the first Wario Land game was subtitled “Super Mario Land 3”). It might also be considered it the third installment in the New Super Mario Bros. series, which started with a handheld installment that combined elements of 2D and 3D Mario games. And of course the 3D gameplay and inclusion of the Tanooki Suit mean the game could also be viewed as an extension of both Super Mario 64 and Super Mario Bros. 3, respectively. Sonic Generations: Developed by Dimps for the 3DS, Sonic Generations attempts to reconcile how depictions differ between classic and modern Sonic. The solution is that classic Sonic is a younger version of the character, before he picked up some additional abilities. Dimps manages to replicate the Sega Genesis classic Sonic’s movement more closely than any other modern Sonic game I’ve ever played (including the console version of Sonic Generations). 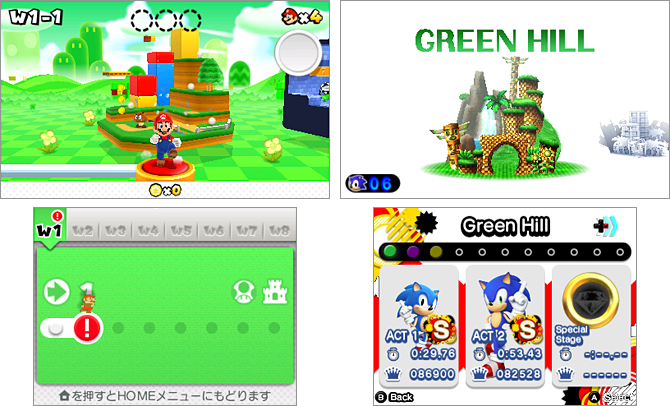 Each stage represents a zone from a key game in the character’s history, presented chronologically, a journey that includes: Sonic The Hedgehog 1-3 (Sega Genesis), Sonic Adventure 1 & 2 (Sega Dreamcast), elements from Sonic Heroes (Gamecube/PS2/Xbox), and the Nintendo DS installments Sonic Rush and Sonic Colors. 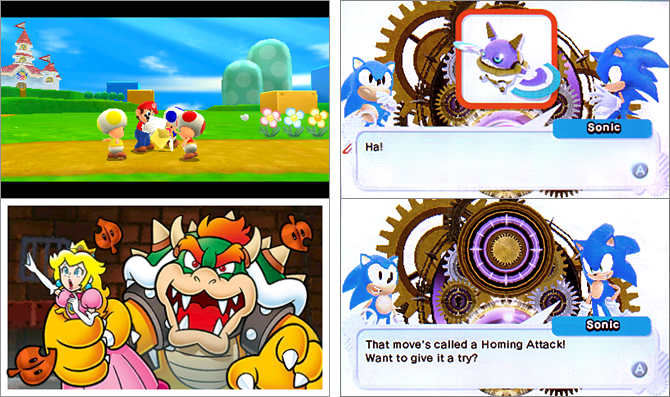 Super Mario 3D Land: Bowser has captured Peach again, and Mario must rescue her. Cinema scenes at the beginning of each world show Mario finding a new postcard, each one illustrating how Peach has been doing (though who’s sending them is another question). It’s a simple enough plot, if not very original. Sonic Generations: The Time Eater is messing with the flow of time, somehow resulting in classic Sonic and modern Sonic meeting each other. Unfortunately, the story is not told via cinema scenes like it is in the console version of the game, but instead attempts to tell the same story via dialogue screens with mixed-to-poor results. Honestly, if you haven’t played the console version first, you might feel yourself a little lost at times as to what exactly is happening. The limitations in dialogue screen storytelling are never more apparent than when still images and minimally-animated figures are used to try and convey some sort of action, such as the laughably awkward scene where modern Sonic demonstrates a Homing Attack for classic Sonic without the scene actually showing a Homing Attack (see above). To make matters worse, even when you know what’s happening the story still doesn’t make logical sense. Why don’t modern Sonic and Tails remember ever having met themselves when they were younger? If classic Sonic learned moves from modern Sonic, why doesn’t modern Sonic remember this? Not to mention that modern Sonic teaching himself something would create a time paradox. Sonic Generations breaks my #1 rule of videogame storytelling: videogames are the one storytelling medium where including a story at all is completely optional, so if you’re not going to put effort into writing a good one, it’s almost preferable that you leave it out entirely. 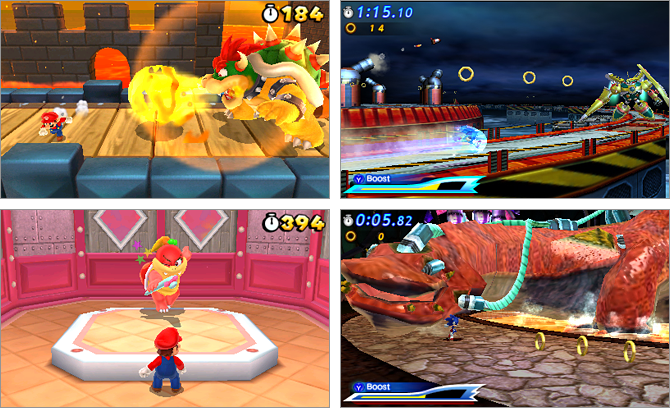 Super Mario 3D Land: There are eight worlds, each world containing four to six levels, plus a castle. Which would make for a total of 48 levels (not including mystery boxes), except that beating the game then unlocks eight more worlds. These feature new levels mixed in with slightly more challenging variations of previous levels, almost like having an entire Lost Levels-style sequel (complete with poison mushrooms) hidden in the game as an unlockable. The result is a grand total of around 95 levels. Sonic Generations: There are seven zones, each zone containing two acts (one for classic Sonic and a slightly more difficult variation for modern Sonic), and a special stage. Mixed in with these are three boss gates (each one containing a one-on-one race and a boss battle), plus a final boss, for a grand total of 28 levels. Super Mario 3D Land: The primary objective is simply to make it to the end of the level, but beyond that there are three star coins in each level to collect, an objective that will appeal mainly to gamers who are collectors or explorers. Gamers who do not enjoy collecting or exploring may dislike that later levels require you to have found a certain number of star coins before they will unlock. Sonic Generations: The primary object is simply to make it to the end of the level, but beyond that you also receive a letter grade based on a combination of how fast you completed the level and how many rings you had upon completion, an objective that will appeal mainly to speedrunners. Super Mario 3D Land: Many of the levels are fairly short, but that’s part of the appeal. They’re like sweet, bite-sized candies, that keep you saying “oh, maybe I’ll have just one more.” The levels themselves contain a mix of new ideas, new twists on old ideas, and combinations of old ideas that make them seem fresh. You may have played levels before that involved jumping toward a flagpole, or that you’ve used a Tanooki Suit to float slowly downwards, but have you ever used a Tanooki Suit to float slowly towards a flagpole? My one minor complaint is that I would’ve liked to have seen the return of the vine boxes that lead to the clouds, instead of a note box bouncing you there. Sonic Generations: Since classic Sonic levels are so much about speed, the obstacles typically exist to try and slow you down. The point is to memorize the placement of these obstacles so that you can avoid them and speed through the level. As a result, Classic Sonic levels typically aren’t as fun the first time through as they are on later runs. One of the main differences between the level design of classic Mario games and classic Sonic games is the level of refinement. Old Mario games seem like the levels have been reworked and reworked and refined until the player reacts to things exactly the way the designer wanted them to, the layout subtly teaching you how to play the game by the way in which objects and items are placed. Meanwhile, old Sonic games come across like the designers threw together a bunch of cool elements at random, and then tweaked the level just enough to fix anything that was broken (or in some ways remaining broken, such as the infamous confusing to hit crab enemy in the first level of Sonic The Hedgehog). 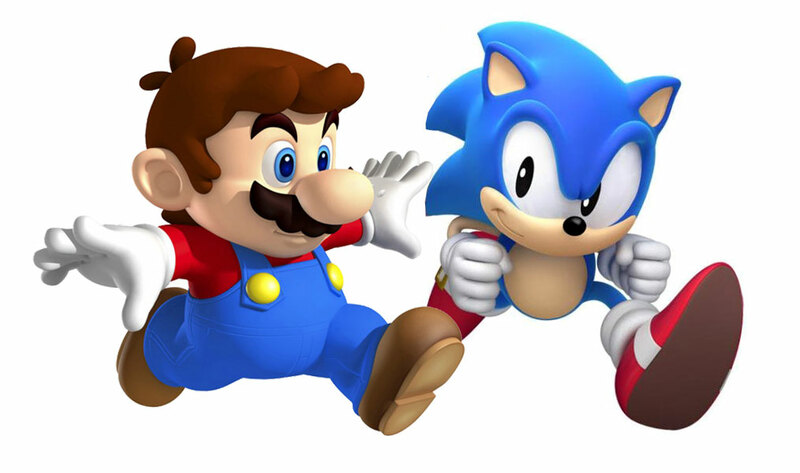 In this way, both Sonic Generations and Super Mario 3D Land each remain faithful to their classic gaming roots. Sonic Generations: Underwater levels can bite me. Sonic has a limit to how long he can stay underwater, though this time can be extended by finding air pockets to let him take a breath. Normally this game mechanic would seem completely reasonable, except for the fact that Sonic has apparently never learned to swim. And water slows him down. In a game where obstacles exist primarily to slow you down, underwater sections come across as one long, tedious punishment. It’s so bad, Mario could even win in a race against Sonic, just as long as he stipulated that it take place in water. The best strategy is to try avoid them by boosting across the top of the water, but even that is a trick only modern Sonic can do. Are there people who actually enjoy Sonic’s underwater levels? Super Mario 3D Land: Mario’s bonus levels are “mystery boxes,” in which you drop into a box filled with random enemies and/or item boxes, and get a star coin (or two) after defeating them. Sonic Generations: Sonic’s bonus levels are special stages, in which you must race through a full pipe while avoiding obstacles, to an emerald that is floating away from you. Although very similar in appearance to the Psycrow races from Earthworm Jim, these special stages are based specifically on levels in Sonic Heroes, which were inspired by the special stages in Sonic The Hedgehog 2. Super Mario 3D Land: Boss battles involve fighting either Bowser or two of his kids. The Bowser fights are based on the original Super Mario Bros., where you must dodge his fireballs and then run past him in order to hit a switch that will cause the bridge to disappear out from under him. Fighting his kids involves jumping on their heads in between dodging attacks. Sonic Generations: Boss battles are that extremely fun variety that involve either standing around—or running in a wide circle that almost feels like running in place on a treadmill—waiting for the enemy to reveal their weak spot so that you can hit it. There is also some dodging and pattern memorization involved, again based around waiting for the enemy to let you hit them. Super Mario 3D Land: People who you encounter via Streetpass or whose Miis fill your Mii Plaza will randomly refill used Toad houses of mystery boxes. Exciting! There’s also a “time attack” feature, comparing your time to other players, but it’s limited only to people you’ve Streetpassed by having your 3DS physically come into contact with theirs (as opposed to collecting their Mii via Mario Kart 7), when it really should include anyone you’ve added to your friend list. Sonic Generations: A dedicated Time Attack mode lets you try to beat your own times, and then compare them to the master leaderboard (rather than just people you’ve Streetpassed). Which is a step up, but even better is the Versus Mode, where you can race people in real-time. Unfortunately, your opponent is only represented as a marker rather than actually being able to see their character, but whatever works. Perhaps my favorite part is that the act of racing online allows you to trade Profile Cards. 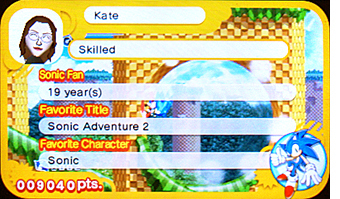 These list the player’s stats, but also allows you to display your favorite character, your favorite title, and how many years you’ve been a Sonic fan. You can also customize it with different card backgrounds, which you unlock by continuing to play the game. Cards that let you express what type of fan you are like this are a fun addition that I’d love to see catch on with other series. In a way, this wasn’t even a fair fight. Not only is Super Mario 3D Land a game that shows other developers how 3DS games should be done, it’s also quite possibly my favorite Mario game that I’ve ever played. Sonic Generations at least didn’t go down without a fight, beating SM3DL in a couple of categories. But SM3DL is a game that any 3DS game would have a difficult time beating right now—sadly, Sonic Generations never stood a chance. Did you enjoy this article? Would you like to see more VS. MODE? Let us know in the comments! How did 3D Land beat Generations? All it had was Bowser, Boom Boom, and Pom POm. Generations had Metal Sonic, Big Arm, Shadow, Biolizard, Silver, Egg Emperor, and Time Eater! And for story, it was the same thing except the Super Leafs fell off. Although yeah, 3D Land is better. While Generations for the 3DS wasn’t exactly a bad game, I still felt left out of the party as the HD versions had so much more to offer. And why does Classic Sonic get the Homing Attack later in the game, and then at the end of the story the Boost? That doesn’t make any sense! You’d think that Sonic would’ve use the Boost to use in games like Sonic Adventure and what not if you consider the story in the 3DS version canon. At least at the HD versions they had Classic Sonic attempt something Modern Sonic had done earlier in that version of the story, only to fail. And it would also explain why Sonic could Homing Attack in Sonic 4. So yeah, I’m gonna have to go with Mario on this one.